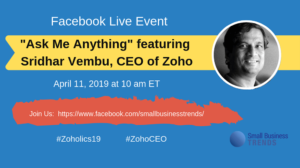 You have a chance next week to ask the CEO of Zoho, one of the leading business software companies in the U.S., anything you want. Small Business Trends is hosting a Facebook Live AMA on Thursday, April 11, at 10 a.m. ET. Our special guest will be Zoho CEO Sridhar Vembu. We’ll be live at Zoholics, the company’s annual developer’s conference in Austin. Small Business Trends CEO Anita Campbell and Brent Leary are co-hosting this live event. You can watch and join the chat with us Thursday by heading to the Small Business Trends Facebook page. You can get a jump start on the conversation. Go to the Small Business Trends Facebook Event posting an get your question in early. Use the hastags #Zoholics19 and #ZohoCEO. Disasters can happen anytime, and how you plan your recovery beforehand will greatly determine the success of your business moving forward. Visa and the U.S. Small Business Administration are holding the Inclusive Innovation Incubator to help small business make such preparations. The goal of the event is to encourage experts across a wide range of fields to find solutions for disaster recovery. They are offering cash prizes for the best solutions. The First Prize will take $25,000, Second Prize $15,000, and Third Prize $10,000. The Inclusive Innovation Incubator is going to be held from May 3-5 in Washington D.C.
Click the red button to register and get more information about the event. Join Applied Marketing Science (AMS) for the next open-enrollment session of “Listening to the Voice of the Customer,” our acclaimed training workshop, on April 23-24, 2019 at the Sheraton Boston Hotel located in the heart of downtown Boston. Led by veteran product development and market research experts, Gerry Katz (AMS Vice Chairman), and John Burns (AMS Principal), this course will introduce Voice of the Customer market research and teach you to use it to accelerate innovation in business-to-business markets. For starters, we’re for Women Entrepreneurs only. During Beach Camp, you’ll have plenty of opportunity to learn, apply and mastermind with warm successful women. You’ll also have time to sleep in and you’ll get long breaks to relax and walk the beach or go for a swim. We didn’t create a conference at the beach just to lock you away in a conference room from dawn til dusk. Beach Camp is a lifestyle focused event so you’ll be spending as much time enjoying your life as you will be focusing on your business. Join us today! Visa and the U.S. Small Business Administration invite you to bring your ideas and your laptop to the Inclusive Innovation Incubator, 2301 Georgia Ave NW, Washington, DC 20001 from May 3rd to May 5th, 2019. Spend a weekend creating solutions to help small businesses recover or prepare for sudden impacts of natural disasters. Team up with entrepreneurs, designers, and developers to build apps and solutions that will help small businesses prepare and/or recover from major natural disasters such as hurricanes, flooding, wildfires, tornados, snowstorms or earthquakes. Watch live on SBA’s Facebook page (https://www.facebook.com/SBAgov/) on May 5th at 6pm ET as the SBA announces the SBA Resource Partners awards. Join us! Watch live on SBA’s Facebook page (https://www.facebook.com/SBAgov/) on May 6th at 12:45pm ET as the SBA announces the Exporter of the Year, Federal Procurement, Small Business Persons of the Year, and National Small Business Person of the Year awards. Join us! The U.S. Small Business Administration and SCORE will host a 2-Day Virtual Conference during National Small Business Week. The conference will take place Tuesday, May 7 – Wednesday, May 8 between 11:00 AM – 5:30 PM Eastern / 8:00 AM – 2:30 PM Pacific each day. Registration is FREE to the public. Learn new strategies, network, and chat with industry experts! This 2-day event will include webinars, business advice, giveaways, free resources, and networking chat rooms for business owners and entrepreneurs. Led by veteran product development and market research experts, this course will introduce Voice of the Customer (VOC) market research and teach you to use it to accelerate innovation in business-to-business markets. The workshop uses a lively, interactive format with numerous hands-on activities and practice exercises to build skills and will also expose you to the latest applications of these techniques in areas such as machine learning and journey mapping. April 11, 2019, Salinas, Calif.
April 12, 2019, Philadelphia, Pa.
April 16, 2019, Minneapolis, Minn.
April 18, 2019, Bellevue, Wash.
April 19, 2019, Oakland, Calif.
April 23, 2019, Nashville, Tenn.
April 23, 2019, Palo Alto, Calif.
April 29, 2019, Lakewood, Colo.
May 1, 2019, Boston, Mass. May 9, 2019, Milwaukee, Wis.
May 9, 2019, Santa Rosa, Calif.
May 14, 2019, Las Vegas, Nev.
May 14, 2019, Atlanta, Ga.
May 14, 2019, San Diego, Calif.
May 15, 2019, San Diego, Calif.
May 15, 2019, Atlanta, Ga. This weekly listing of small business events, contests and awards is provided as a community service by Small Business Trends. You can see a full list of events, contest and award listings or post your own events by visiting the Small Business Events Calendar.